Dreaming about escaping from it all? Come to Goa, tucked away on the Konkan coast, this land is blessed with lush green fields, swaying palms on white sandy beaches. Endless stretches of golden sun soaked sands, foam crested azure waters and translucent blue skies…..come, escape to the Coconut Grove in Goa. This brand new villa style property set amongst the coconut groves. It is located 250m from Betalbatim beach in South Goa will appeal to all looking for a truly relaxing break in a excellent standard of accommodation. It's quiet location makes it ideal to relax and soak in the sun on the endless stretches of golden sands of Betalbatim beach, which is only a short walk away. 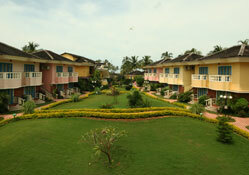 The resort consists of 36 deluxe double rooms and 2 cottages. Primavera: The elegant all day dining air-conditioned a-la-carte restaurant also has an outdoor terrace overlooking the poolside. While you lounge on the pool deck and soak up the sun let the poolside bar cool you down with exotic cocktails or appetizers. And as evening falls watch the poolside come alive with weekly barbeques and theme nights and let the live jazz, retro or reggae band keep your feet tapping into the night. Business Centre, Beauty Parlour, Shopping Arcade, Swimming Pool, Airport/Station Transfers, Doctor on Call, Money Changer, Fax, E-mail, Internet Access, Banking, Safe Deposit, Baby Sitting, Valet, Travel Desk. Room Facilities: Each room is tastefully designed and well equipped with air-conditioning, satellite TV and mini-bar. Lie in your tub bath, of your three fixtured bathroom, with hot or cold water or curl up on the verandah overlooking the landscaped lawns, with your favourite book.